“Deej went to his first salsa class in October 2002 with little idea of what salsa was about. After two of months of two classes each week, he still didn’t have much idea but he was certainly enjoying himself and developing a real hunger for his salsa and looked for more. Over the next six months he danced several nights a week, and his knowledge and technique improved quickly, particularly as he was matching time in lessons with time dancing freestyle. He’d been dancing less than nine months when he was first asked to teach (an advanced class!) as a substitute for a local teacher. The class went well and soon he was covering classes on an almost regular basis. With a wealth of experience in training assorted disciplines from advanced motorcycling to computing skills, Deej took quickly to teaching salsa and on a salsa holiday three months later, he was called upon by fellow advanced students to lead them in a demonstration at the end of the week. Helping local teachers over the next few months, Deej gained valuable teaching experience but became increasingly frustrated in an environment where he wasn’t free to implement his own ideas. 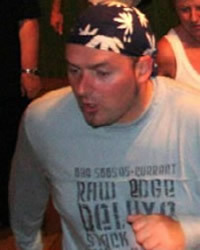 When an opportunity arose for Deej to take on his own club, he grasped it and so it transpired that less than two years after taking his first salsa steps, Deej was running his own weekly Strictly Salsa clubnights in Boroughbridge together with partner Trisha, with clubnights in York following two years later in summer 2006. As well as steadily building a strong local following, Deej has earnt a reputation as a respected and popular guest teacher and is being increasingly asked to make appearances teaching salsa at local, national and overseas events.